This article is mainly about how to convert password PDF to image with the command line application EEPDF PDF to Image Converter Command Line. PDF (Portable Document Format) is widely used in our daily life and work. 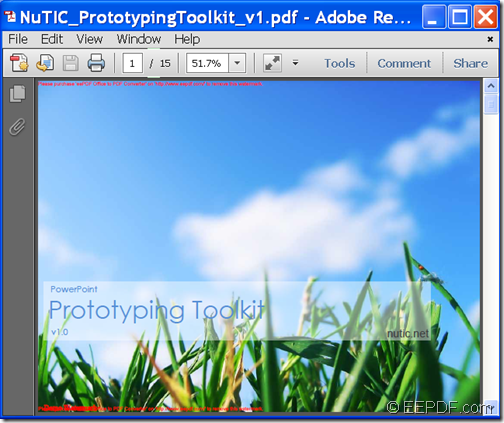 To read the contents in PDF, you have to install a PDF viewer. But public computers or portable devices may not have a PDF viewer installed. To solve this problem, converting the PDF documents to images that can be opened by common applications will be a good choice. EEPDF PDF to Image Converter Command Line is a professional application for converting PDF formats to various image formats and make different settings for the output images. 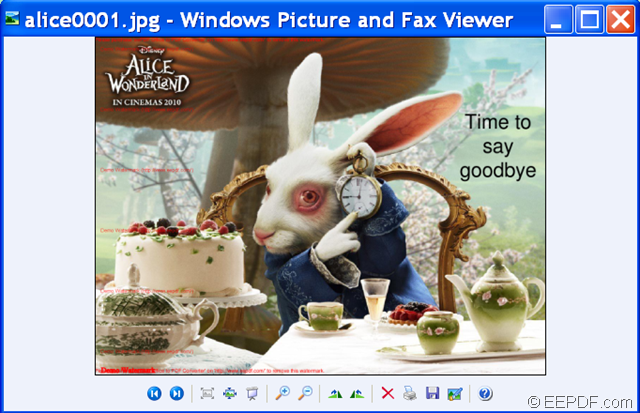 The output image formats can be JPG, PNG, BMP, GIF, TIFF, TGA, PCX, PNM, RAS, PBM, etc. What’s more, it is able to convert owner password protected PDF (disable editing, changing, copying, printing, etc.) and user password protected PDF (disable opening) to image. In the following contents, you will see how to use this application to convert owner/ user password protected PDF document to image. Please download the package of EEPDF PDF to Image Converter Command Line at first. The downloaded file is a ZIP file, so please unzip it to a folder on your computer disk after the download. In the unzipped folder, you can see an executable file named as pdf2img.exe which is the called program and a TXT document named readme.txt which can be regarded as the user manual of this application. <PDF-file>:specify the path of the input PDF file. This example is to convert an owner password and user password protected PDF named sign.pdf to sign.png image. To run the commands, please press the Enter button on the keyboard. Several seconds later, you can get the output image in the location that you have specified. The command line application EEPDF PDF to Image Converter Command Line allows you to convert PDF to image (JPG/ PNG/TIFF/GIF) with anti-aliasing on Windows platform. Anti-aliasing can reduce the prominence of jaggies by surrounding the stairsteps with intermediate shades of gray (for gray-scaling devices) or color (for color devices). EEPDF PDF to Image Converter Command Line is a powerful application that can convert PDF to various image formats such as JPG, PNG, TIFF, BMP, GIF, TGA, PCX, PNM, RAS, PBM, etc. In addition, it enables to set font anti-aliasing, vector anti-aliasing, and image anti-aliasing for the converted image. To know how to convert a PDF document to image with font anti-aliasing, vector anti-aliasing, or image anti-aliasing, please do as follows. Firstly, please free download EEPDF PDF to Image Converter Command Line and unzip the downloaded file to a folder on the computer disk. In the unzipped package, there is an executable file named as pdf2img.exe which is the called program in MS-DOS interface. Then, please open the MS-DOS command prompt window in which you can input commands. To know how to input commands to do the conversion, you can read the TXT document named as readme.txt which explains the usage and options in detail. <PDF-file>: the path of the source PDF file. <img-file >: the path of the target image. -aa <string> : enable font anti-aliasing: yes/no. -aavec <string> : enable vector anti-aliasing: yes/no. -aaimg <string> : enable image anti-aliasing: yes/no. The first example is to convert a PDF document named apple.pdf to apple.png image and set the font anti-aliasing as 10.The second example is to convert new.pdf document to new.jpg image and set the image anti-aliasing as 30. With the help of EEPDF PDF to Image Converter Command Line, you can convert PDF to multipage black and white TIFF. As a command line application, EEPDF PDF to Image Converter Command Line can convert PDF to JPG, PNG, BMP, GIF, TIF, TGA, PCX, PNM, PBM, RAS, etc. image and make different settings for the created image. What’s more, it supports to convert multipage PDF to multipage black and white TIFF. Just by following the steps below, you can successfully convert PDF of multiple pages to TIFF of black and white. Please download the package of EEPDF PDF to Image Converter Command Line first. 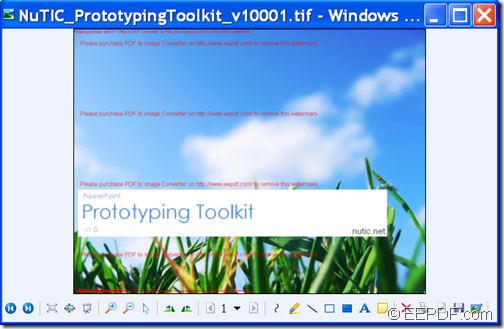 Then, please extract the package to a local folder on the computer, After the extraction, there should be an executable file named pdf2img.exe and it is the called program of this application. To input commands, please open the MS-DOS command prompt window. In the opened MS-DOS command prompt window, please input your commands referring to the command line template shown below. pdf2img: please input the path where the called program—pdf2img.exe is located. <PDF-file>: please specify the path of the input PDF file. <img-file >: please specify the path of the output TIFF file. -multipage : create multipage TIFF file. -mono: generate a monochrome/black-and-white image file. To make you better understand the above command line template and options, please see the following example. This example is to convert a multipage PDF named sign.pdf to multipage black and white TIF file. At last, please press the Enter button on the keyboard to run the commands. Do you want to convert PDF to JPG image and optimize JPG quality? If so, the application EEPDF PDF to Image Converter Command Line will be the optimal choice for you. PDF (Portable Document Format) is a popular file format that is widely used to share, exchange documents with friends, colleagues, etc. However, public or shared computers may not have a PDF viewer installed. 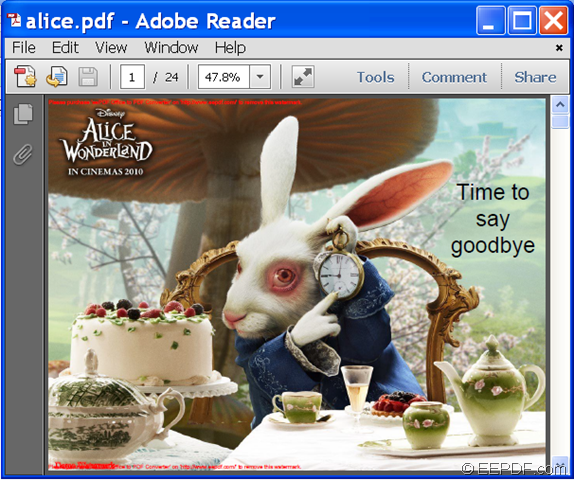 To solve this problem, converting PDF document to image may be an alternative to consider. EEPDF PDF to Image Converter Command Line is a professional command line application that can convert PDF to image (JPG, PNG, BMP, GIF, TIF, TGA, PCX, PNM, PBM, RAS, etc.). What’s more, it allows you to set image quality, resolution, etc. for the converted images. The following contents will focus on how to convert PDF to JPG image and set the JPG image quality. To realize this conversion, please continue read the following contents. Please free download EEPDF PDF to Image Converter Command Line and unzip the downloaded ZIP file to a folder on your computer. In the extracted folder, there is an executable file named pdf2img.exe which is the called program in the MS-DOS command prompt window. Please open the MS-DOS command prompt window in which you can input commands. Then, please refer to the following command line template to input your commands. pdf2img: you need to input the full path of the called program—pdf2img.exe. <PDF-file>: you need to input the path of the source PDF file. <img-file >: please input the path where you’d like to save the converted JPG image. To optimize the converted image, you can use the option: -quality <int> which is used to set quality to JPEG format and <int> can be any number from 0 to 100. This example is to convert a PDF document named alice.pdf to alice.jpg image and set the image quality as 100. After inputting the commands, please hit the Enter button on the keyboard to run your commands. Note: The trial version will leave watermarks on the converted image. To remove the watermarks, please buy the full version of EEPDF PDF to Image Converter Command Line. This article is mainly about how to convert PDF to FAX TIFF and compress TIFF with the application EEPDF PDF to Image Converter Command Line. PDF (Portable Document Format) is a popular file format that can transfer data electronically while preserving the original texts, images, format, layout, etc. Sometimes, you may need to convert PDF to FAX compatible TIFF (Tagged Image File Format) file that is popular among scanning, faxing, etc. EEPDF PDF to Image Converter Command Line is a powerful command line application which can convert PDF to image (JPG, TIF, BMP, PNG, GIF, TGA, PCX, PNM, RAS, PBM, etc.). In addition, it supports to compress TIFF during the conversion from PDF to TIFF. Just by following the steps shown below, you can successfully convert PDF to compressed TIFF. Please download the package of EEPDF PDF to Image Converter Command Line. Then, please unzip the package to a folder in your computer disk. In the unzipped folder, you can find an executable file named pdf2img.exe which is the called program of this application. In order to input commands, please open the MS-DOS command prompt window. After opening MS-DOS command prompt window, you can input commands referring to the following command line template. <img-file >: specify the output image file. This example is to convert PDF to TIFF and compress the TIFF file with LZW compression mode. At last, please press the Enter button on the keyboard to run your commands. Please see the conversion effect from the following snapshots.